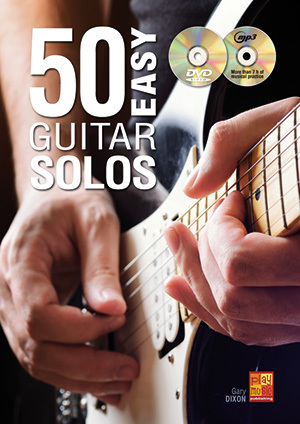 50 Easy Guitar Solos (GUITAR, Coursebooks, Gary Dixon). This tutorial comprises 50 top-class guitar solos inspired by the world’s greatest guitarists – past and present. What is special about these ‘easy’ solos? It is the fact that they are accessible to everyone. Here even the guitarist-to-be is offered the possibility to take over the lead guitar part. But easiness doesn’t exclude diversity. To make this tour through the world of guitar soloing instructive, but also interesting and entertaining, the solos included in this tutorial feature different keys, modes (major and minor) and forms (binary and ternary), they differ in their density and in their richness of phrasing. The introductory chapter outfits you with the tools (scales and articulation techniques) you need to know for thoroughly under- standing the 50 solos presented here; provided with this knowledge, you will be able to extend and develop them and possibly even to create some of your own. The DVD attached to the tutorial offers you the possibility to mindfully observe all 50 guitar solos – first at actual playing speed, then at a slower speed. This again gives you the opportunity to closely follow up the movement of the hands, to choose the right fingerings and keep in time(!) For its part, the MP3 CD is composed of as many backing tracks as there are solos in the tutorial; the 50 backing tracks are recorded at two different tempi: the intended tempo (actual playing speed) and the rehearsal tempo (slower speed). The backing tracks provided here are of an appropriate length (about 4 to 5 minutes each, which sums up to almost 7 h of musical practice). This means that you have enough time at your disposal to practice under the best conditions.